Antananarivo (formerly known as “Analamanga” and “Tananarive”) is the capital of the Republic of Madagascar and its largest city. It is located on a high plateau overlooking the Ikopa and Besiboka Rivers. In the southern part of the city lay Lake Anosy, an artificially designed lake. In 2012 Antananarivo had a population of 1.4 million and the Merina are the majority ethnic group in the region. 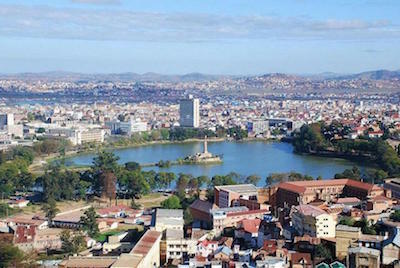 In addition to being a political center, Antananarivo is Madagascar’s economic and cultural center. In the Malagasy language Antananarivo means “town of a thousand.” It received its name from King Adrianjaka (1610-1630), whom many consider the first major political leader of the Merina people. In the early 1600s he established a fort and town comprised of 1,000 soldiers and their families at the location. Before the Merina army settled there the land was known as the “Analamanga” or “Blue Forest” region, which accounts for the earliest name of the town. As the Merina kingdom grew Antananarivo became an important military and agricultural center. The city’s high plateau allowed the Merina to establish a heavily militarized defense in central Madagascar. The city’s surrounding wetlands produced rice. By the early 1700s the Merina kingdom had fractured into competing groups. To consolidate power and reunify the warring tribes, Chief Andrianampoinimerina, the king of one of the groups, attacked Antananarivo in 1794, successfully ending the rule of his uncle, the city’s leader. Andrianampoinimerina’s son, Radama I, completed the uniting of the various groups after taking control in 1810. Under his leadership the city’s population grew to 15,000 and he amassed an army of 13,000 soldiers. By the early 1800s the Merina were aware of both European encroachment and political threats from other Madagascar kingdoms. To protect Antananarivo they briefly banned foreigners and prevented the building of roads to the city. In 1895, when the French army arrived and conquered the area following the Partition of Africa, over 50,000 people lived in the city. Also by that point enslaved Africans constituted half of the city’s population. During colonialism the French changed the city’s name to “Tananarive” and made it the political and economic center of the entire island of Madagascar, which they now controlled. The French restructured the city’s urban layout but preserved the historic royal palaces belonging to earlier Merina rulers. In 1910 the French finished their construction of railroad lines linking the city to coastal ports. Madagascar received its independence from France in 1960, and Tananarive became the capital of the new nation. Twelve years later in 1972 the government renamed the city “Antananarivo.” Today Antananarivo is the economic hub of Madagascar. It produces cement, tobacco, beer, soap and textiles for international and domestic consumption. It is also home to numerous cultural institutions such as the University of Antananarivo, the Rova Palace, the Andafiavaratra Museum as well as the site of the Tsimbazaza Zoo and the Ivato International airport. Like many urban centers, Antananarivo suffers from urban blight and poor sanitation. The city’s problems have been exacerbated by Madagascar’s poverty and a 2002 civil war, which imposed additional hardships on the local population. “Antananarico,” New Encyclopedia of Africa 2nd Edition, editors John Middleton and Joseph Miller (Detroit: Charles Scribner’s Sons, 2008): Ari Nave, “Antananarivo, Madagascar,” Africana: The Encyclopedia of the African and African American Experience, 2nd Edition (New York: Oxford University Press, 2005); Solofo Randrianja and Stephen Ellis, Madagascar: A Short History (Chicago: University of Chicago Press, 2009).